The brand new SUV VW Touareg 2019 has beautiful and superior design. It is equipped with a lot of extras which place it among the leaders from the premium car class. 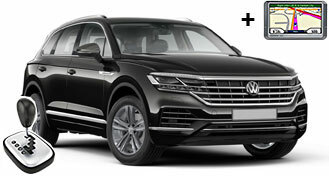 VW Touareg has powerful 3.0 l diesel engine with 204 hp. The maximum speed reachable on the highway is 286 km/h with acceleration 0-100 km/h for 9 seconds. The combination of appearance and extras make the travel unforgettable and luxurious premium experience. VW Touareg 2019 is the perfect choice for rental car from the highest class SUVs with automatic transmission and built-in navigation. VW Touareg 2019 is premium SUV car is ideal for pleasant and comfortable transportation of up to 5 passengers. Many extras, huge trunk and awesome look are only some of the advantages of the new Touareg 2019. All wheel driving makes Touareg perfect for all road conditions. The latest technologies make the driving of this amazing vehicle a pleasure like no other, as the automatical transmission make it highly preferred for urban and non-urban conditions. Rented for a week. I could say for sure it is a high-tech SUV that offers more than what you get from some other fancy brands in the group and it's cheaper. It's big, solid, smart and capable. Highly recommended!